Wine Blogging Wednesday 52 is upon us, and I couldn’t be more excited. This installment of WBW is hosted by Tim from Cheap Wine Ratings. Tim asked us to taste, and write about, inexpensive Chilean red wines. I happen to love cheap wine, when it’s good, and cheap Chilean red wine often is too good to pass up. You can find Tim on twitter. WBW founder Lenn of Lenndevours can be found on twitter as well. I looked around my local wine store, which has THOUSANDS of different wines, for a few Chilean reds. My first preference was to pick up one or two inexpensive bottles, and then a bit more expensive one to compare. Unfortunately, I was faced with a very small selection of Chilean reds, so I got what I could. I picked up two Anakena wines, and a Morande wine. All are Carmenere, which is a varietal I do enjoy and have had before. Robin and I used to enjoy Concha y Toro’s Carmenere, also from Chile, as an everyday red wine when we first looked for an everyday red wine. That is more of a mass produced wine, and these were a bit better quality. The first wine of the night was the Anakena Vintage 2007 Carmenere from the Rapel Valley. I am going to assume that the grapes were sourced from multiple vineyards, as the second wine of the night was the Anakena 2006 Single Vineyard Carmenere. 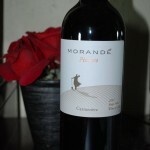 The final wine was the Morande Pionero, a 2007 Maipo Valley Carmenre. The wines were all enjoyable, and had quite different characteristics. The Morande surprised me, and I think the video below will show that! The video is me tasting and reviewing the wines, as well as some chatting with the people who were watching me record the video in my ustream channel. The Anakena 2007 Carmenere was $7.99 at my local wine store. It definitely fit the value part of the Wine Blogging Wednesday task. I just wasn’t sure if it would fit the GOOD wine part. The wine had a dark plum like color, with an earthy nose. It had a medium body, on the lighter side, with noticeable but not firm tannins. The initial palate is almost chocolate, quickly opening into a heavy dark berry flavor. There was a good amount of spice on the finish, though a bit of white or green pepper, rather than black pepper. While the wine only had 13.5% alcohol by volume, ABV, some alcohol burn on the nasal passages was noticeable. It wasn’t unpleasant, but it was there. This wine is most certainly a food wine, and paired really nicely with a steak. I would certainly have this wine again, especially with a steak or pot roast or other grilled meats. For an $8 red wine, it’ll definitely see my table again. 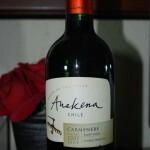 Our next wine, the Anakena 2006 Single Vineyard Carmenere was a very pleasant red wine. While only $9.99, it was a bit more refined and elegant than it’s sister. A more red, garnet color than the purple color of the other Anakena, it’s nose was quite different as well. Much more fruit on the bouquet, there were elements of red raspberry and other ripe red fruits. The palate was more silky and elegant, and the long finish was quite enjoyable. This wine shows more as a sipping wine than solely a food wine. The berries, while not new-world fruity, were balanced nicely with a muted spice and pepper component. The Anakena 2006 Single Vineyard Carmenere was definitely my favorite wine of the three. 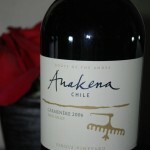 This wine, as well as the first Anakena, definitely showed the grape’s Bordeaux heritage. Both wines were more in the old world tradition, not as lush and fruity as new world West Coast USA wines. Carmenere was originally a French grape that made it’s way to Chile by being mistaken for Merlot grapes. The grapes have quite similar color and leaf characteristics, though the Carmenere bunches are tighter and compact, while the merlot grapes are longer and looser. Carmenere is also found in Italy, as well as in the US. It is apparently making it’s way back to France as well. The final Chilean Carmenere was from the Morande vineyard in the Maipo Valley. This 2007 red wine was only $8.99, but was quite different from the other two wines. I did not do the typical research, looking up the geography of where the grapes were grown, or other facts. I am sure the wikipedia link above has much of that if you’re the scholarly type. However, I am wondering if the growing regions influenced the grapes much, and will have to look into that soon. This wine was similar in color to the first Anakena, showing a purple, inky color. Additionally, the Morande, as well as the Single Vineyard Anakena, had 14% ABV. The nose of this wine was full of chocolate and blackberry fruit, with some earth. The bouquet was a bit more complex than the other two, with some wood, cedar perhaps, showing underneath the fruit. The Morande had a much lighter mouth feel than the other two wines. It’s palate was fruit forward, with a quick transition to spicy and woody flavors. However, there was some added complexity in a very surprising minty, eucolyptus component. There was some floral component there as well. I was quite surpised by the palate, and it was a unique and interesting wine. Tasting this wine with the steak, flavors of mint exploded in my mouth. It was a very nice food and wine pairing, though perhaps a bit unorthodox. All three of these wines were quite enjoyable, especially for value wines under $10. Actually, I thought for wines under $20 they more than held their own. I certainly would love to try more Chilean reds, and look forward to putting them up against the three I wrote about here. What Chilean reds are you enjoying? I would love to hear your thoughts, so please, take a moment to comment below! If you haven’t had a Chilean red, perhaps you’ve got a red Tannat from Uruguay for me to try, so let me know what it is!